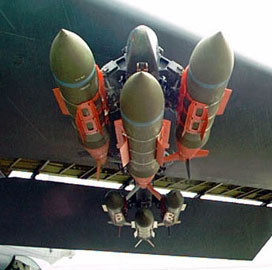 Boeing (NYSE: BA) has received a $311.8 million ceiling increase modification under a U.S. Air Force contract for the production of Joint Direct Attack Munition tail kits. The company will supply the military service with JDAM inertial guidance kits designed to increase bomb accuracy through global positioning system-based guidance updates, the Defense Department said Monday. Boeing’s defense, space and security business will perform work through March 30, 2020. USAF will obligate fiscal 2018 procurement and operations and maintenance funds for the modification award. A JDAM kit consists of an inertial navigation system along with a GPS engineered to help the weapon engage targets.